Cat toys are heaven-sent for any cat parents for many reasons. One, because these keep your cat preoccupied when it's ignoring you (sorry, human). Two, these keep your upholstery and other stuff safe from scratches and hairballs. Last, feline toys are good stuff for your bonding moments. If you are thinking about which toys to give to your cat, worry not because we compiled a list for you. Depending on your budget and needs, you can buy a thing or two from our list so you and your furry feline will be happy. 1. What Are Cat Toys? Cat toys are small items to keep your tabby happy, tame, healthy, and active. These toys are for scratching, nibbling, playing, and other cat activities. 2. What Do Cat Toys Do? Boredom and loneliness are any pet's worst enemy, so these cat toys are meant to keep your cat happy and busy. Most times, your cat will be acting like a cat (oh, you know it), so these toys will be the focus of its attention. These will also keep her active (thus, healthier) and boost your bond level. 3. Do You Really Need to Buy Cat Toys? No, you don't need it, but you may like to have them. Cats are rowdy and playful creatures, and you don't want your precious sofa to have scratches if they can't find something to play with. So for you and your cat's peace of mind, buy a cat toy. 4. Where Can You Buy the Toys? You can drop by your local pet shop or buy online through Amazon. We finalized our list based on simple criteria: function, features, pros and cons, and price and availability. Function is how well the toy performs its intended purpose. Features are the toy's materials, design, and operating mechanisms. Pros and Cons are the qualities we like and didn't like about the toy. Lastly, Price and Availability are our assessment if the toy is bang-for-the-buck and where you can get it. The toys in our list cost from around $ to $$ (very pocket-friendly). If want to literally rattle your cat with a nice toy, give it the Midnight Crazies from Hartz. Weighing only 0.8 ounces, this ball is not like the normal jingle ball. Instead of being completely enclosed, the ball has rectangular slots. 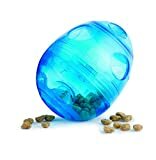 These allow your cat to see the ball inside so it will be tempted to paw the ball. The slots also allow your cat's claws to get through, so it won't burst or shatter easily like a solid ball would. A pack comes with 7 balls of different colors. The balls are made of durable plastic to resist those claws, so your cat shakes, rattles and rolls the balls around for hours. Watch your cat attack wrestle and snuggle with this Kong kickeroo. Appeals to cats instinctive desire to stalk and capture prey. Size shape and material were specially chosen to promote wrestling and hind paw kicking. Cats are simple creatures. They smell catnip; they are on it. So keep your tabby happy with a kickeroo toy from Kong. The Kong kickeroo is designed to survive your cat's claw-y snuggles and paw kicking. It has a fluffy tail and a pillow with a bold colored pattern to attract your cat's attention. It makes a clinking sound when swung around so your cat will definitely enjoy wrestling with it. This toy is also laced with a strong blend of every cat's irresistible favorite: catnip. This will attract your cat's interest and keep is entertainment value for a long time. Comes in pink cow, tiger or giraffe patterns. Most cat toys are designed to appeal to your cat's feral nature. 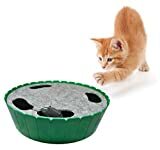 Those hunting instincts can come to life with Petstages Tower Tracks toy. Like the toy tower toy kids, this toy has three doughnut-shaped plates stacked on top of each other. Each stack has a ball inside that can freely move along the edge; your cat can bat these balls around. Give this toy to your cat and wake the beast inside your pet! Not really, but this toy is good as an entertainment source and exercise gadget for your fat tabby. This toy is made of high-quality hard plastic to survive your cat's paws. What if you can give your cat a scratch post, a bed and a play place - all in one item? Then give your cat the Collapsible Lounge Bed from YOUTHINK. YOUTHINK's product is something your cat can play in, take naps on, and scratch with. The secret lies in the product's cleverly designed collapsible mainframe. 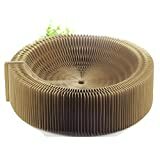 An accordion stack of hard cardboard panels (with an ingenious shape) is unfolded around an axis to reveal a round base with a space big enough for your cat to lie on. This bed also doubles as a scratching pad for your cat. To use, just sprinkle a good amount of catnip (comes with the package) and watch your cat make itself cozy on its new bed/scratch post. The package also comes with a ball toy bell for your cat to play with. If you want your tabby to work for its food, then get the PetSafeFUNKitty food dispenser. PetSafe's interactive food dispenser combines exercise with chow time. The cleverly designed egg-shaped dispenser spits out kibbles when rolled by your cat. This way your cat will be encouraged to "work out" to earn its delicious rewards. To double the fun factor, the egg rolls in different directions depending on the amount of food inside. The container has three different sized openings so you can control the amount of food your cat can get. The container is made of high-quality translucent plastic to keep your cat's food safe and secure. You don't need a real mouse to give your cat something to hunt. Just give it the Purrfect Feline interactive toy and your cat's all set. This bowl-shaped device is the whack-a-mole toy for your cat. A mechanical "mouse" peeks out of the four holes. When your cat pounces at the mouse, it automatically hides. Rinse and repeat. Truly the purr-fect toy for your feline friend. Give this to your cat to keep it happy and busy (while you take a nap). Most of the time, all your cat needs is something to scratch. Spare your furniture the agony and give your cat a specialized scratcher toy. This 16-inch toy has a centerpiece which serves as the scratcher (made of durable cardboard), a groove around its edges where you can place the accompanying toy ball. Place your cat (or cats) near it and watch them have fun! 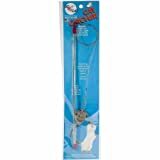 If you want to play along with your cat, the Go Cat Teaser Wand is a great choice for your quality pet time. This toy features a 12-inch wand with a flexible wire (like a fishing rod). At the end is a pet-safe mouse toy. Just dangle the "mouse" in front of your cat and watch it try to snag and pounce at it! Just make sure to store it in secure storage when not in use. 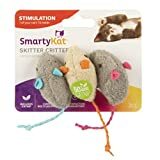 Mice are cat's best friends, so give your cat its critter partner: SmartyKat Catnip toys. Each pack contains three cute mice loaded with catnip, making it irresistible for your cat. Each mouse is big enough (4 inches) to be batted and pawed, and durable enough to survive bites and scratches. Cats love to nibble so protect their teeth (and your things) by giving them a specialized chew toy from Petstages. The Petstages Dental Kitty Chew Wheel is made of durable rubber. It also has two ribbons tied to its sides as a secondary chew piece. This toy is ideal to keep your cat busy and happy. Sprinkle some catnip, and your cat will play in peace! 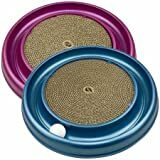 The cat toys we have on our list are designed to keep your cats active, so they stay healthy. We recommend buying what your cat needs. The prices are affordable, and it is always worth your penny because these toys will keep you and your cat excited and happy.